Doha’s sporting facilities sparkle as brilliantly as the sun that sits on top of this fast-developing city. From an Aladdin’s cave of hi-tech athletics equipment and stadia, the high jumper Mutaz Essa Barshim has emerged as a true track and field icon for Qatar and the wider Middle East region. All that is missing is the global stage to show off such treasures, but that could happen if the city wins the bid to stage the 2019 IAAF World Championships. Sebastian Coe and his IAAF evaluation committee have already visited Doha’s two rivals – Eugene in the United States and Barcelona in Spain – as the competition to hold the world’s third largest sporting event after the Olympics and FIFA World Cup nears its conclusion on November 18. The Qatari capital is the last stop on the evaluation committee’s three-stop global tour and they cannot fail to have been impressed with Doha’s desire to host the IAAF’s flagship event plus the state-of-the-art facilities it plans to use to deliver it. In the Aspetar, for example, a specialist sports medicine hospital in the athletics epicentre of Doha, world-class medics and physiotherapists surrounded by an amazing array of underwater and anti-gravity treadmills help athletes bounce back from injuries. Impressively, the same centre boasts a staggering 25 twin bedrooms that double up as altitude chambers – enough to house an entire national team. When Chris Earle was director of sport at Loughborough University in England from 2002-2012, he oversaw one Powerbase gym. Yet today, in the same role in charge of the Aspire Academy in Doha, he has four on his doorstep, not to mention the indoor arena that staged the 2010 IAAF World Indoor Championships. Outside, the nearby Khalifa Stadium, which was first built in 1976 and upgraded for the 2006 Asian Games, is undergoing another massive facelift. This involves raising the capacity to at least 45-47,000 and installing giant cold water tanks that will pump cool air under spectator seats and across the in-field. The notoriously hot climate in Qatar is one factor that will concern fans and most of all athletes. The proposed dates of the 2019 World Championships, though, are late September through to early October, when temperatures usually dip significantly, especially during the evening when darkness falls and the marathons, for example, are due to be held. “It will be no warmer than for some past world championships,” says Sheikh Saoud bin Abdulrahman Al-Thani, secretary general of the Qatar Olympic committee. Indeed, it could even be cooler for those who remember temperatures at the 1999 IAAF World Championships in Seville – a Spanish city known as the ‘frying pan of Europe’ – when they nudged 40C during the middle of the day in August. The 1997 IAAF World Championships in Athens were similarly hot, while the Beijing and Athens Olympics are hardly remembered for their chilly weather. Shubenkov’s comments about attracting a young audience of fans in a part of the world that is not a traditional athletics hotspot will have been music to the IAAF’s ears. 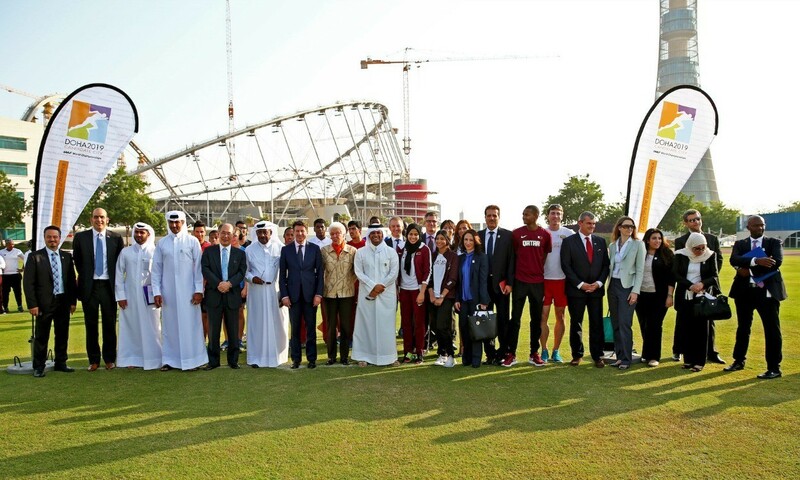 During Seb Coe’s wrap-up speech at the end of his two-day tour of Doha, for example, the IAAF vice-president mentioned the importance of “young people” at least three times when weighing up what he described as “three very different cities and three very different bids”. Linked to this, youngsters are very much at the forefront of Doha’s sporting strategy, thereby ticking the all-important ‘legacy’ box. Children aged 4-12 in Doha, for instance, are tested by a 15-strong team of talent scouts, with the best of the best signed up to join the Aspire Academy where they combine sport and studies in the same establishment. It is a young programme in an oil rich city which is still in its infancy, but graduates from the burgeoning scheme so far include none other than Barshim. As a young writer for Athletics Weekly, I visited Doha in early October of the year 2000 on the way home from the Sydney Olympics to cover the IAAF Grand Prix Final. Back then, it was a quirky venue on the calendar and few could have imagined it evolving to bid for the IAAF World Championships little more than 14 years later. Yet from those humble beginnings the city has been building its repertoire of events, such as the 2006 Asian Games, 2010 World Indoors, the Diamond League and, next year, the IPC Athletics World Championships. The heat is most definitely on for Doha, but I take them to triumph when the IAAF votes in Monaco on November 18. Barcelona is a terrific city with a fine record of staging events like the 1992 Olympics and, in 2010, the European Championships, whereas Eugene offers the chance to take the IAAF World Championships into the United States for the first time and to a genuinely athletics-mad area of America. Yet Doha has the similar allure of bringing the event to the Middle East for the first time in history. That alone might not be enough to win, but its fantastic facilities and incredible infrastructure should prove the deciding factor. FIFA awarded the 2022 World Cup to Qatar and I expect its capital city to be second-time lucky when it comes to holding the IAAF World Championships. As for the Olympics? That could not be too far away either.